This latest campaign by the British state and her auxiliaries is due to Republicans, rightly, refusing to engage with the Parades Commission which demands that they “give notification” of their intention to take to the streets to remember their dead. Bearing in mind that the Parades Commission reserves the right to impose conditions on parades which can effectively ban, them this “giving notification” can be seen as just another doublespeak phrase synonymous with “asking permission.” Couple this with the fact that in order to “give notification” an organiser of an event must attend an RUC/PSNI station and give their forms “to a member of the Royal Ulster Constabulary not below the rank of sergeant” it can easily be seen why Republicans baulk at the idea. One cannot in all seriousness claim to follow in the footsteps of Pearse, Connolly, Mellows and Sands while allowing a British commission and armed force to decide the manner of your activities. It is important to separate parades and protest marches. Protest marches by necessity have to take to the streets in as public a manner as possible. The march in these cases are the event and are usually followed up by a rally of sorts. For single issue causes such as internment or prisoner issues a committee that is not acting under the authority of the Republican Movement can be used to engage with the Parades Commission. 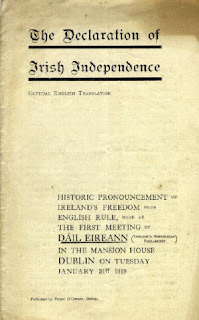 There is no conflict of principle here, though it is distasteful, as the committee is not claiming to be the inheritor of the mantle of the Irish Republic. This is usually not the case when it comes to commemorating our patriot dead, particularly Easter commemorations. Usually the commemorations are held under the auspices of the Republican Movement and so there can be no involvement with the Parades Commission. Generally, parades should not be seen as a thing in themselves; they are not necessarily a part of the commemoration. They get the crowd from Point A, the assembly point, to Point B, the location of the commemoration itself. I have been to commemorations where there have been multiple bands, colour parties and thousands of participants and I have been to commemorations where there were only a handful assembling at a graveside. I can honestly say that I have never felt that one was better than the other or that there was less honour done to the memory of the fallen for their being but a few present. I can see no reason, therefore, why a parade should be seen as a compulsory part of any commemoration. Surely assembling at the point of commemoration makes more sense than assembling at a different point and marching to the commemoration in the full knowledge that the forces of the state are likely to intervene at some stage. We should not invite an attack that we cannot defend against. 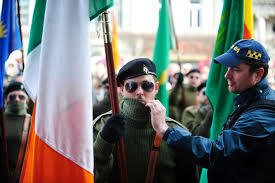 On Holy Saturday 2018 a commemoration in Lurgan, Co. Armagh was attacked by the RUC/PSNI resulting in injuries to several people, including one woman in her 70s, the arrest of members of the colour party and the loss of flags and related equipment. The Brits of course not only disrupted a commemoration and arrested some Republicans but they also had a great propaganda victory. Pictures were seen around the world of them carrying out a speedy and efficient raid where they seized several people in masks and combat gear and whisked them away. Republicans may have claimed a moral victory in that only the lowest of the low would attack a commemoration but the Brits had the physical victory and moral victories have yet to win a war only physical victories do that. How then can we avoid constant repeat occurrences of what went on last Easter? How can we both commemorate our dead in peace and do so with our morals and principles intact? I would start by evaluating each commemorative event to see if it is possible or indeed necessary to have a parade as part of it. The event in Lurgan was an easy target for the Brits as there were not the numbers there to protect the colour party or the people present. Attacks of that sort are rare and are not seen where there are large numbers in attendance. It should be obvious to organisers that if they cannot protect a parade then they should not organise one. Whatever about members of Republican organisations you cannot expect ordinary people to willingly put their neck in the noose. At this point I can imagine parade enthusiasts shaking their heads in disgust. It is my experience that many people view the parade as the be all and end all of commemorations. I have the opposite view. A parade can be nice, it can add to the commemoration, but the commemoration is the main thing. I have seen parades drum up trade, as it were, along the route so that some bystanders join in. This happens to great effect in Bundoran at their annual Hunger Strike Commemoration. 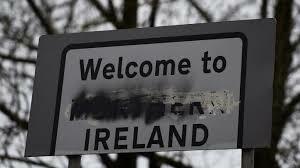 That is in the 26 Counties though where the Parades Commission or any similar body does not enter into things. In the Occupied 6 Counties though the band effect is offset by the RUC/PSNI with their banners and loud-hailers warning people that “this is an illegal parade”. Organisers need to weigh up whether the few extra people gathered up by having a parade to a commemoration site is worth the harassment from state forces that goes along with it. Parades are often used as shows of strength and can be great for morale. This is fine where there is a large crowd and a well turned out colour party but it has the opposite effect where there is a poor crowd and the colour party are taken away in the back of landrovers. Do I really need to say that this is a sign of abject weakness and destroys morale? No discussion of parades and colour parties can go without mentioning the near ubiquitous use of combat gear and masks. This look is always used by the mainstream media to attack those involved in the commemoration. It is described as “paramilitary uniform” and is used to justify the attacks and arrests by the RUC/PSNI. Again this hands a propaganda victory to the Brits. Not too long ago the combat gear was used sparingly and was enough to raise eyebrows when it was seen. Most colour parties wore black and white and looked just as well. I have never heard of anyone being charged with having a white shirt. I have though heard ordinary Irish people complain about men in combat gear on the streets. Some find it intimidating. I have heard complaints about people wearing masks too and the usual response to this is that they need masks or they'd be arrested. But I have also seen colour parties get dressed in full view of state forces and then put on a mask. I've seen a Branch man pull a mask down to get a good view of the wearer during a commemoration. I've even seen a Republican steward pull down a mask to give the wearer a drink! And of course a mask is of little help in preserving anonymity when you're sitting in the back of a jeep. My advice here is to ditch the constant use of masks and combat gear and to use them only sparingly. To sum up then I would say to Republicans to continue to have nothing to do with the Parades Commission or any other British body. Only organise parades where you can get away with it. Do not feel that you must have a parade or that you must sacrifice yourself and other participants to the RUC/PSNI just to remember our dead. Remember that we are in a propaganda war and we should not be giving the enemy cheap victories. 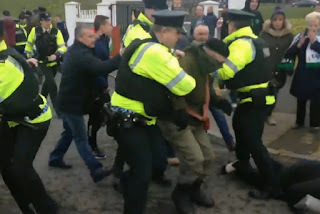 The Brits are only too delighted to keep on attacking parades and arresting people. The work of the Irish Republic cannot be carried out if everyone is in jail or on bail with strict conditions.